Laser Wart Removal - When to Consider? For facial wart removal, laser treatment offers the advantage of little or no scarring, and this is important in the facial area. In some cases the dermatologist may decide to use a laser to treat warts in children that are bothersome or cause for concern without trying other methods first, depending on where the wart is located as well as the size and type involved. The younger the child is the more likely it is that laser wart removal may be recommended. Any wart that causes concern, looks abnormal, or appears to grow at an abnormal pace should be evaluated by a dermatologist to rule out any serious conditions such as cancerous growths. Another situation where laser wart removal should be considered is for genital warts treatment. The virus that causes genital warts will not be destroyed by the laser, but the wart tissue can be removed without leaving scars or damaging any of the surrounding skin. Often genital warts can be tough to remove, and the tissue can return after it has been eliminated. With laser wart removal the cost is higher than with many other methods, but this cost may be covered by insurance in many cases. 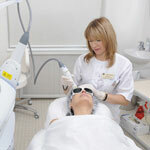 You should consider laser treatment for any warts which are stubborn or can not be removed using other methods.